In 2013, Critical Correspondence initiated a project dedicated to the examination of dance in the museum today–its politics, economics, and aesthetics. Acknowledging a long history of cross-pollination between dance and the visual arts–some driven by artists, some by institutions–our hope is to create a forum, based in a dance institution, for the voices of those affected by and invested in these issues. 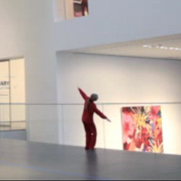 Dance and the Museum was conceived and curated by Nicole Daunic and Abigail Levine.